There are a lot of things to consider and manage when making the decision to purchase an investment property. 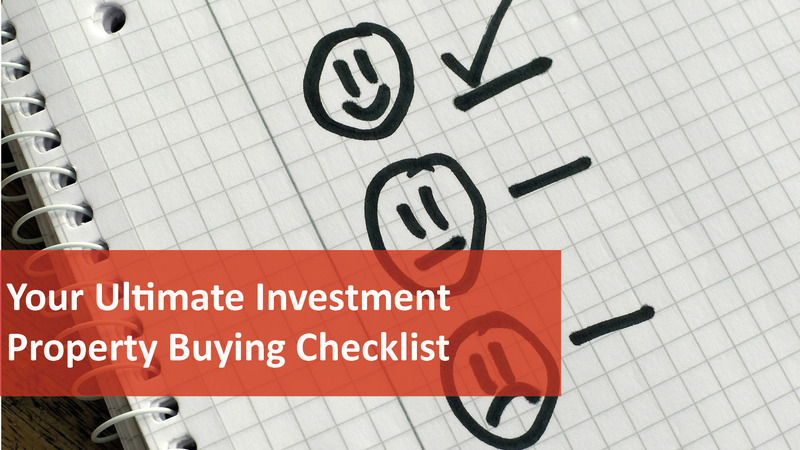 Follow our checklist when purchasing your first or next investment property and watch your wealth grow. Understand why you’re planning to buy that property. Why are you investing – what size portfolio are you planning to grow? This way you can set your investment strategy. If you don’t know where you’re heading any road may get your there, but most roads can get you lost. First thing’s first: you need to get your budget sorted. Do you spend less than you earn? Have you saved a deposit? How much spare cash do you have each month to service your loans? There’s no point in even beginning your property search until you’ve completed this step, because determining your spending level and what you can afford will narrow down your property purchase decisions. It’s likely that you’ll be needing a bit of financial help in the form of a bank loan when you make your purchase, so see a finance broker and ensure you have your pre-approval sorted before you begin looking. While it’s important to keep an eye on interest rates, there are many other important factors in determining the best loan for you, so it’s worth working with a mortgage broker to make sure you’re getting the most flexible loan structure to suit your needs. Being prepared will make the whole process easier and put you in a better negotiating position. This is such an important part of buying property Remember the location of your property will account for up to 80 per cent of its performance. Spend your time researching different suburbs, considering factors like demographics, the local economy, jobs creation, new infrastructure, access to schools and shopping centres. Look for an “investment grade” property in that location – one that will be in continuous strong demand by a wide range of people that will want to live there. Your property must also appeal to owner occupiers who will want to buy similar properties pushing up values in the area. While you could do everything yourself in between work, family and other commitments, if you’re a novice when it comes to the property market, then help from a buyer’s agent can take a lot of the confusion out of the process and level the playing field. When you’re buying property, this is not the time to make rash or emotional decisions. When you begin inspecting potential properties, check out how the toilet flushes, whether the taps all work, how strong the water pressure is in the shower, and whether the power points work. Once you’ve found a property that you’re seriously interested in purchasing, if it’s a stand-alone property rather than part of a block of apartments, it’s crucial to hire a building and pest inspector who can prepare a report for you. They will perform function and safety inspections of the property and inspect the entire house, top to bottom, and write up an evaluation that details whether the building is up to code or not. It’s also advised to have a pest inspection conducted too. It can be easy to become carried away with big goals and bold dreams of finding the perfect investments, but it’s important to remain practical about it. Remember…no property will tick all the boxes. However, if the property doesn’t stack up or if the price is too high, walk away. There will always be other properties. Remember…you don’t have to accept the asking price; always try and negotiate. Conditions such as the length and date of settlement, deposit, early access to the property and rent-back opportunities could swing the deal in your favour. Buying a property is not something that can be done on a whim. It takes time to find the right piece of real estate for you, so give yourself a realistic timeframe to search, locate, negotiate and buy your property. Becoming familiar with the market will help you to gain a better understanding of how the process of successful property investing works, which will ultimately help you make the best decision. If you ever want to chat to someone about purchasing your next investment property, give our team a call on (08) 6254 6300.